There’s a moment near the end of Sneaky Pete‘s first episode that I’m sure many of us have been waiting for. In this moment Marius, a con man who’s recently out of prison and on the run from a mobster named Vince, realizes that the $100,000 he owes the man isn’t something to shrug off. No, Vince wants his money, and he’s willing to do just about anything to get it back, including cutting off the fingers of Marius’ brother Eddie; one finger for each week Marius doesn’t pay him back. The “moment” itself comes when Vince, only a name spoken in hushed tones up until this point, appears on screen for the first time, asserting his gravitas and presence immediately. It’s the return of Bryan Cranston to episodic television, and it’s the moment that really sells the intrigue of Sneaky Pete. Of course, Sneaky Pete is by no means “The Bryan Cranston Show,” but that final scene bears mentioning because the first half of “Pilot” struggles to break free of the typical constraints of a pilot episode. There’s an awful lot of setup in those first 25 minutes, and while most of it is necessary, it also doesn’t feel like the fully formed version of Sneaky Pete we’ll be getting each week. Once “Pilot” turns the corner though and settles into its procedural elements and the high-wire act that is Marius stealing another man’s identity, things pick up, and there’s a better sense of what Sneaky Pete might look like as the season rolls on, and how Cranston’s Vincent will be a formidable adversary to Marius. 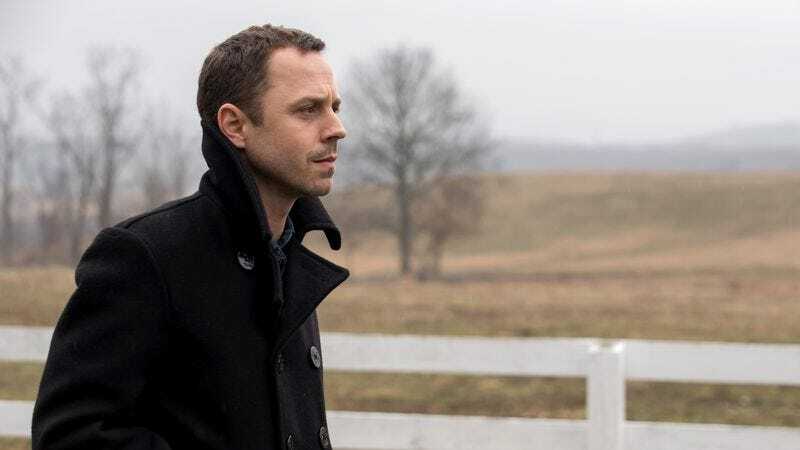 Those sluggish, overstuffed first 25 minutes introduce us to Marius (Giovanni Ribisi), a con man who’s about to get out of prison and reconnect with his brother Eddie (Mr. Robot‘s Michael Drayer). However, after a phone call with Eddie reveals that a mobster named Vince (Bryan Cranston) still believes Marius owes him $100,000, heading back home suddenly isn’t an option. So, Marius does what any other con man would: he listens intently to his chatty cellmate in order to gather information about his life so that he can steal his identity. Sure enough, Marius gets out of prison and finds his way to a farmhouse in upstate New York. The farmhouse is owned by the grandparents of his cellmate Pete, and since they haven’t seen their grandson in 20 years, Marius has no trouble sliding into his identity. He uses everything Pete told him to ingratiate himself to Audrey (Margo Martindale) and Otto (Peter Gerety), reminiscing about the apple tree that used to adorn the front lawn, and doing his best to keep up with the details of the family’s bail bonds business. For all the slackness in the earliest portions of “Pilot,” there’s great tension and a few laughs in these scenes, underscored by an engaging dynamic between the actors. Marius will certainly suffer the consequences of being Pete at some point, but “Pilot” is more interested in using the identity balancing act as a source of comedy. Watching Marius try to deflect from childhood memories brought up by Pete’s cousin Taylor is both nerve racking and hilarious, Ribisi’s signature puzzled facial expressions only hinting at the truth of who he is. So while “Pilot” does struggle to bring some clarity and definition to its initial setup, it also presents a storytelling structure that’ll be interesting to watch unfold. “Pilot” is equal parts case-of-the-week procedural, family drama, and crime caper. Sneaky Pete does a good job of finding a balance amongst those elements. If there’s a weak link in the bunch it’s the procedural aspect, which comes in the form of Marius teaming up with Pete’s cousin Julia to take down a man skipping out on his court appearance. The hunt isn’t all that interesting, even as Marius comes to realize that the man they’re looking for is actually a well-connected mob boss who just might have a reason for hurting him, and never quite finds the proper balance between being dramatically compelling and also occasionally funny. There’s a bit of Chuck in there, but without the charm, and that could be a problem going forward. With that said, “Pilot” builds a solid amount of mystery out of its other elements. Particularly, one gets the sense that there’s more to the story of the farmhouse and the bail bonds business than Otto and Audrey Bernhardt are letting on. They’re certainly not your typical rural family, but just how atypical they are is a question that “Pilot” leaves unanswered for now. One thing we do know is that Marius, by the end of the episode, finds himself falling for the family. In them he sees the comfort, stability, and love that he didn’t get from his own parents, as his upbringing was heavy on self-sufficiency and emotional trauma. It’s a bit of a cliché to have Marius develop a loving rapport with the very family he’s conning, but Sneaky Pete largely avoids anything too obvious or blunt, instead shooting for subtle nods to the way in which Marius might find some sense of himself amongst these people. What’ll be interesting to watch play out over the season’s 10 episodes is how the show finds a balance between all of its different elements. It’s difficult to tell whether the pilot’s occasional messiness can be chalked up to the usual table-setting constraints of a pilot episode, or if the various genre influences are just too much to handle. That’s something that will become clearer as the season continues, but for now “Pilot” boasts enough good—particularly the performances—to warrant queuing up the next episode. Welcome to The A.V. Club’s reviews of Sneaky Pete! Because this is the age of constant consumption, we’ll be posting a new review every other day. As always, if you’ve watched ahead in the season, please keep the comments section spoiler-free, or at least clearly mark anything that’s a potential spoiler. Be kind to one another! Ribisi is such an inspired choice for Marius/Pete. He’s so naturally skeezy, which I swear is a compliment. I’ll be curious to see if Sneaky Pete spends some time on the relationship between Marius and his brother Eddie. If the aim is to make Marius feel conflicted about his allegiances, we’re going to need something more to connect to. For as much as I didn’t really enjoy the hunt for Abraham, the scene where he and his mother openly talk about killing Julia right in front of her is perfectly-pitched comedy. Abraham is in fact Max Perron, head of Construction and Protection, which means exactly what you think it means. Apparently nobody is who they seem on Sneaky Pete. Check back on Sunday for a review of episode two!